Editor’s note: Thanks to Sierra Stages for bringing this poignant production to town. “In October 1998, a twenty-one-year-old student at the University of Wyoming was kidnapped, severely beaten, and left tied to a fence in the middle of the prairie outside Laramie, Wyoming. His bloody, bruised, and battered body was not discovered until the next day, and he died several days later in an area hospital. His name was Matthew Shepard, and he was the victim of this assault because he was gay. “Moisés Kaufman and fellow members of the Tectonic Theater Project made six trips to Laramie over the course of a year and a half, in the aftermath of the beating and during the trial of the two young men accused of killing Shepard. They conducted more than 200 interviews with the people of the town. 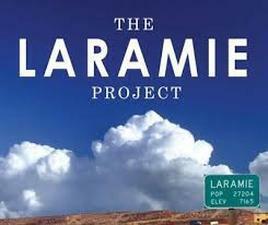 Some people interviewed were directly connected to the case, while others were citizens of Laramie, and the breadth of the reactions to the crime is fascinating. Sierra Stages continues to enrich our communities and our lives. Previous Previous post: Welcome Ken and Alexis to western Nevada County CA!